The Division of Kingston is an Australian Electoral Division in South Australia covering the outer southern suburbs of Adelaide. The 171 km² seat stretches from Hallett Cove and O'Halloran Hill in the north to Sellicks Beach in the south, including the suburbs of Aldinga Beach, Christie Downs, Christies Beach, Hackham, Hallett Cove, Huntfield Heights, Lonsdale, Maslin Beach, Moana, Morphett Vale, Old Noarlunga, Onkaparinga Hills, Port Noarlunga, Reynella, Seaford, Sellicks Beach, Sheidow Park, Port Willunga, Trott Park, Woodcroft, and parts of Happy Valley and McLaren Flat. Division of Kingston in South Australia, as of the 2019 federal election. The division was named after Charles Kingston, Premier of South Australia (1893–1899), elected to the first House of Representatives in 1901 and the first Federal member of the Division of Adelaide in 1903. Kingston was first based on the Holdfast Bay area to the north of the current boundaries from the 1949 election as a notionally marginal to fairly safe Labor seat. However, it fell to the Liberals in that election, only to have Labor win it at the 1951 election. This started a tradition of Labor and the Liberals alternating for long spells in a seat that has slowly moved south over the decades. It has now moved almost clear of its original boundaries; Hallett Cove is the only suburb within the seat's current borders that was part of the seat in 1949. It has tended to elect an MP from the governing party of the day, having elected only four opposition MPs. Notably, every sitting member in the electorate's history has been defeated at the polls—none have retired or resigned. Kingston has been represented by Labor MP Amanda Rishworth since the 2007 election where she won with a 54.4 percent two-party vote from a 4.5 percent swing. Going into the 2010 election, it was the most marginal Labor seat in South Australia. However, Rishworth consolidated her hold on the seat in 2010 by winning a 64 percent two-party vote from a 9.5 percent swing. At the 2013 election, Rishworth suffered a 4.9 percent swing to finish on a 59.7 percent two-party vote, but was still the second largest vote of any party in Kingston's history. In 2016, Rishworth further strengthened her hold on Kingston by boosting her majority to 67.1 percent on a swing of 7.7 percent, the strongest result in the seat's history. It is now Labor's second-safest seat in South Australia, behind only Port Adelaide, on two-party terms, however on the primary vote Kingston polled one percent higher at over 49 percent, the highest primary vote of South Australia's 11 seats. Though Labor picked up a two-party swing in all eleven seats, the presence of Nick Xenophon Team candidates in all eleven seats produced, apart from a suppressed major party primary vote, a result where Rishworth was the only major party candidate in the state to pick up a primary vote swing. Kingston began to move south from 1969 when the Holdfast Bay area was transferred to the newly created seat of Hawker. 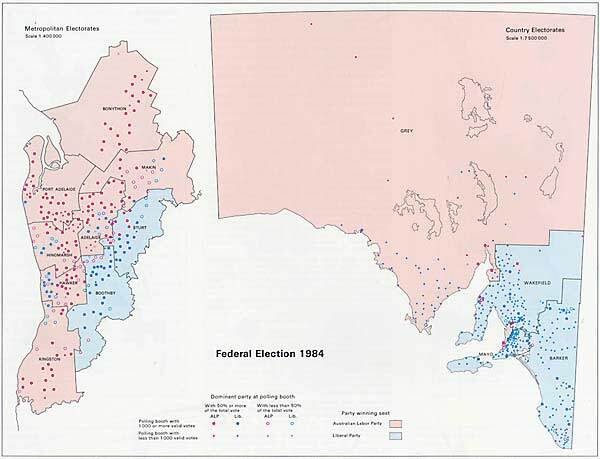 Successive redistributions saw Hawker continue to push Kingston south over time, and by 1984 the seat had moved to roughly its current position, though without the current southern coastal strip. The redistribution before the 2013 election removed Kingston's rural areas with the transfer of around 6,500 voters in McLaren Vale and Willunga to Mayo, increasing Labor's Kingston margin by half a percent. This substantially reduced the area covered by the electorate, down from 377 to 171 square kilometres, almost the same as the 2001 to 2004 boundaries. The previous larger boundaries were used from 2004 to 2013 and loosely from 1993 to 1998. ^ Munro, Ian (26 July 2010). "Labor incumbent looks safe in see-saw seat". The Sydney Morning Herald. Fairfax Media. Retrieved 4 January 2011. ^ Kingston, SA, Virtual Tally Room 2016, Australian Electoral Commission.